Spouting anti-immigrant invective is a great way to get elected in certain Euro states these days, but guess what? Blaming societal ills on immigrants doesn’t pay the rent. Or the interest you owe on your junk bonds. 5-Star and Liga knew that railing against the Eurozone and stumping for “independence” was an effective ploy to get officials elected. They also know Italy is utterly incapable of independence, beset by every sort of economic problem you can think of: Debt to GDP, unemployment, zero appetite for fiscal reform, etc. They know that they need Germany, and that their best bet is to put their full weight behind their current house of cards and push with all their might toward their more responsible neighbors to the north. This is one major reason that the anti-Brussels parties that triumphed in recent Italian elections—5-Star and Lega, suddenly dropped talk about leaving the Euro. They are betting that Macron and Markel and their proposed new EU architecture will pull their debt chestnuts out of the fire at expense of German taxpayers. It’s a timebomb ticking ever louder. 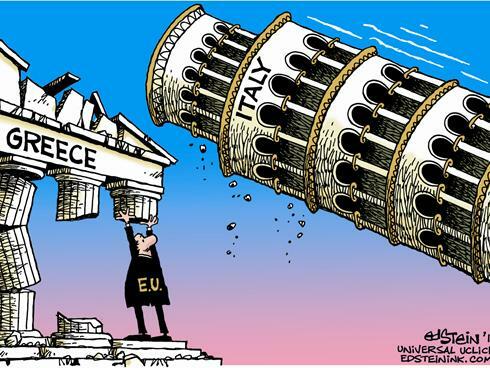 In plain English that would mean the strong surplus economies of Germany and northern Europe including Holland, would have to “transfer” hundreds of billions of Euros to subsidize the deficit countries of Italy, Spain and southern Europe. The ultimate winner would be the shaky French and Southern Eurozone banks. It’s not surprising that Merkel, a close ally of former banker Marcon of France, is not being open with her people on what is at stake. In a transfer union, the healthier countries of the Euro will support the weaker. This is behind Macron’s call for a common Eurozone Finance Minister who would develop a common tax budget for the ECB member countries. The deeper underlying problem in all these schemes is the fact that the countries of the ECB and Euro have done nothing fundamental to clean up their banking insolvency mess. Instead the ECB under Draghi has been used to create what is today a de facto insoluble problem for the German and other strong central banks of the Euro.